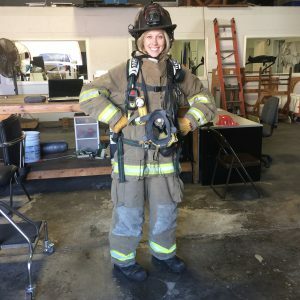 Victoria LaPointe, LPTA at Industrial Wellness Rehab decided to try on the full gear for one of our City of Mobile fireman. We are happy to report Victoria made a full lap around our building in full gear and the patient graduated from work conditioning. It’s been a good day! Work Conditioning is designed for patients who have progressed past the need for physical therapy or require general body reconditioning for a successful return to full duty. Many patients in this program are working light duty and will attend three (3) days a week for up to a four (4) hour time period. The program involves full body conditioning, cardiovascular activity and simulated work tasks for the patient’s specific job. The goal of Work Conditioning is to ensure the patient is capable of safely returning to the required tasks of their job. We like to keep it real at IWR. Experience why we are different than the rest.